A breed of digial filmmakers is harnessing the power of classic video production lenses, coupled to DSLR and other HD cameras. Classic B4 mount lenses are ideal for shooting digital films and videos thanks to generous optical zoom and a constant aperture. With the Fotodiox Pro Turbopack 9000 Kit, you can unlock even more power from these classic lenses. Video production lenses like the ones pictured here have a motorized servo mechanism built in. With just the flip of a switch, you can go from a fully manual lens to a fully motorized variable speed zoom. With the Fotodiox Pro Turbopack 9000 Kit, you can connect Turbopack power supply directly to your lens, and power it for hours of dramatic zooms. The Turbopack outputs (1.7/4.75 mm female power plug) any of three voltages - 12 V, 16 V, or 19 V. Power up the Turbopack with the included AC charger, and the 4 LED meter lets you know how much run power is left. Simply connect the Turbopack to your lens with your choice of either a 6 pin or 12 pin connecting cable. Then, depending on your specific lens, you'll get powered fuctions like cruise zoom, quick zoom, iris return, and more. The Turbopack 9000 does not have a "sleep" function, so your lens is fully powered at all times, ready to go at a moment's notice. 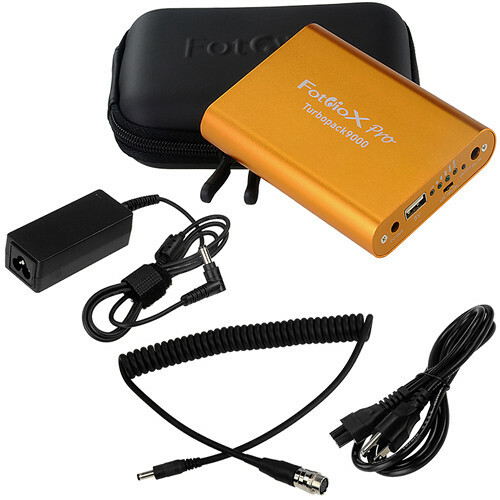 Also built in is a USB port that can be used to power your camera, or charge a phone or tablet, etc. The Turobopack is rated for 25Wh for extra long run times between charges. Box Dimensions (LxWxH) 8.6 x 7.4 x 3.3"